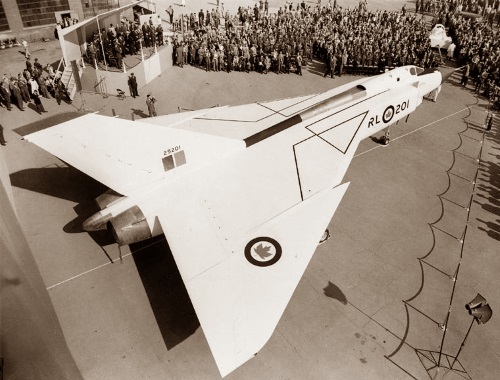 For the Canadian aviation industry, and for Avro Canada in particular, the traumatic story of the CF-105 Arrow was paralleled by that of the contemporary British Aircraft Corporation TSR-2 in the UK. Both of these formidable warplane types were destroyed before entering production by inflexible policies formulated by politicians who, in 1957, were convinced that missile technology had advanced to the stage at which manned interceptor aircraft would no longer be needed. The CF-105 was the culmination of a series of design studies launched in 1953 to consider improved versions of the Avro Canada CF-100 Canuck. After considerable study, the Royal Canadian Air Force selected a considerably more powerful design and full-scale development began in March 1955. Intended to be built directly from the production line, thereby removing the hand-built prototype phase, the first Arrow Mk 1 was rolled out on 4 October 1957 and this machine began its flight trials with a maiden flight on 25 March 1958. The aeroplane rapidly demonstrated excellent handling and overall performance, and another three Arrow Mk 1 aircraft were completed powered, like the first, by two Pratt & Whitney J75 turbojet engines. The lighter and more powerful Canadian-designed Orenda Iroquois engine was intended for the service version, and the first Arrow Mk 2 with the Iroquois powerplant was ready for taxi testing in preparation for flight and acceptance tests by RCAF pilots by a time early in 1959. On 20 February 1959, the development of both the Arrow interceptor and the Iroquois engine was terminated before any project review had taken place, and two months later an order was issued for the destruction of the assembly line, tooling, plans and existing airframes and engines. The origins of the need for the Arrow can be found in the period after World War II as the USSR began to create a force of long-range bombers with the ability to deliver nuclear weapons across North America and Europe. The principal threat was that of high-speed, high-altitude bombers taking off from Soviet territory to fly over the Arctic against military bases and urban/industrial areas in Canada and the USA. To counter this threat, Western countries began the development of interceptors able to engage and destroy these bombers before they reached their targets. 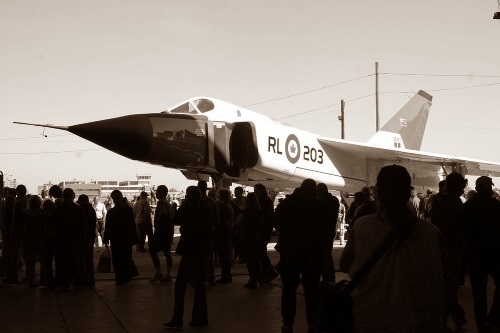 Canada’s first essay in this arena was the Avro Canada CF-100 Canuck all-weather interceptor, which toiled through a lengthy and troubled prototype stage before entering service in 1953. It went on to become one of the longest-serving aircraft of its class, and left service in 1981. Recognising that the delays which had affected the development and deployment of the CF-100 could also affect its successor, and the fact that the Soviets were working on newer bombers which would render the CF-100 ineffective, the RCAF began looking for a supersonic, missile-armed replacement for the subsonic Canuck even before it had entered service, and issued its requirement to Avro Canada in March 1952. Avro Canada was already considering supersonic flight factors, and decided that the more difficult problem was that of wave drag, which increases rapidly at high subsonic speed. German research in World War II had shown that the onset of wave drag could be greatly reduced by the use of aerofoils which varied in curvature as gradually as possible. This suggested the use of thinner aerofoils with much longer chord than designers would have used on subsonic aircraft, but such aerofoils were deemed undesirable as they possessed little volume for armament or fuel. However, it was soon realised that it was possible to ‘deceive’ the airflow into the same behaviour by the use of a conventional thicker but sharply swept aerofoil. This provided many of the advantages of a thinner airfoil while also retaining the volume needed for strength and fuel tankage. Another advantage was that the swept wing was clear of the supersonic shock wave generated by the aeroplane’s nose. Almost every fighter project in the post-war era immediately adopted the concept, which started appearing on production fighters late in the 1940s. Avro engineers explored versions of the CF-100 with swept wings and tails as the CF-103. This offered improved transonic performance with supersonic abilities in a dive. The baseline CF-100 was steadily improved through this period, however, and after a CF-100 had broken the ‘sound barrier’ on 18 December 1952, interest in the CF-103 waned. An alternative solution to the high-speed problem is the delta wing, which has many of the swept wing’s advantages for transonic and supersonic performance, but provides greater volume and a larger area, offering the possibility of greater fuel capacity and more lift at high altitude. The delta wing also facilitates slower landings than the swept wing under certain conditions. Disadvantages are increased drag at lower speeds and altitudes, and higher drag while manoeuvring. For an interceptor in the early 1950s these were not significant problems though, as the aeroplane would spend most of its time flying in straight lines at high altitudes and speeds. Further proposals based on the delta wing resulted in two versions of the design known as C104: these were the single-engined C104/4 and twin-engined C104/2. The designs were otherwise similar and based on a low-set delta wing. The primary advantages of the C104/2 were a larger overall size and thus an internal weapons bay of greater volume, and twin-engined reliability. The proposals were submitted to the RCAF in June 1952. Talks between Avro and the RCAF examined a wide range of alternative sizes and configurations for a supersonic interceptor, culminating in RCAF’s Specification AIR 7-3 of April 1953 demanding a two-man crew, a twin-engined powerplant, a range of 300 nm (345 miles; 556 km) for a normal low-speed mission, and 200 nm (230 miles; 370 km) for a high-speed interception mission. The specification also demanded the ability to operate from a 6,000-ft (1830-m) runway, a cruising speed of Mach 1.5 at 70,000 ft (21335 m), manoeuvrability for 2-g turns with no loss of speed or altitude at Mach 1.5 and 50,000 ft (15240 m), and a climb of 5 minutes from engine start to 50,000 ft (15240 m) and Mach 1.5. Avro submitted its C105 design in May 1953 as what was in essence a two-seat version of the C104/2 with a shoulder-set wing to provide easy access to the aeroplane’s internal elements, weapons bay and engines. The new design also allowed the wing to be built as a single structure incorporating the upper fuselage, simplifying construction and improving strength. However, the wing’s relocation demanded a longer main landing gear unit which had, nonetheless, still to fit within the thin delta wing. Five different wing sizes were offered ranging between 1,000 and 1,400 sq ft (92.9 and 130.1 m²), and those that were selected had an area of 1,200 sq ft (111.5 m²). The engines considered for the powerplant were the Bristol Olympus OL.3, the Curtiss-Wright J67 (a US-built version of the British Olympus) and the Orenda TR.9. Armament was stored in a large ventral bay occupying more than 33% of the fuselage, and the weapons which could be carried included the Hughes Falcon or CARDE Velvet Glove air-to-air missile, or four 1,000-lb (454-kg) bombs. The Velvet Glove radar-guided missile had been under development with the RCAF for some time, but was believed unsuitable for supersonic speeds and also to lack development potential, and was therefore cancelled in 1956. In July 1953 Avro Canada’s proposal was accepted and the company was contracted to begin a full design study of the CF-105. The whole programme was at first limited, but the Soviet introduction of the Myasishchev M-4 ‘Bison’ turbojet-powered bomber and the testing of the USSR’s first hydrogen bomb resulted in a dramatic change in ‘Cold War’ priorities. 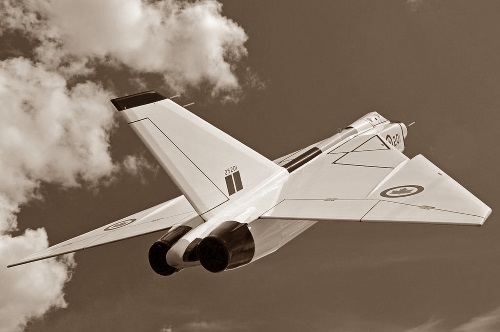 In March 1955, Avro Canada’s contract was upgraded to cover the creation of five Arrow Mk 1 flight-test aircraft, to be followed by 35 Arrow Mk 2 interceptors with production engines and fire-control systems. To meet the RCAF’s schedule, Avro Canada decided to forego any prototype construction in favour of manufacture of the first test airframes on production jigs. Any changes deemed necessary were then to be incorporated into the jigs while flight testing continued, with full production starting when the latter was complete. It was appreciated that this was risky, and in an effort to mitigate the risks a major testing effort was launched. By the middle of 1954, the first production drawings had been issued and wind tunnel work begun, and computer simulation studies were undertaken in both Canada and the USA using sophisticated computer programmes. Additionally, nine instrumented free-flight models were mounted on Nike rocket boosters and launched from Point Petre over Lake Ontario, and another two from the NACA facility at Wallops Island, Virginia, over the Atlantic Ocean. These models were designed for the evaluation of aerodynamic drag and stability at speeds of more than Mach 1.7, and at the end of their single flights were deliberately crashed into the water. The experimental effort revealed a requirement for only a small number of design changes, mainly involving the wing profile and positioning, and the area-rule concept, revealed in 1952, was also applied to the design. This resulted in several changes including the addition of a tail cone, the sharpening of the radar nose’s profile, the thinning of the air-intake lips, and the reduction of the fuselage’s cross section below the cockpit. Use of the Rolls-Royce RB.106 turbojet had been considered for the first aircraft, but with the cancellation of the RB.106 programme in 1954, it was decided to use the J67. In 1955 this too was cancelled, leaving the design with no engine, and the J75 was selected for the CF-105 Mk 1 test flight aircraft with the TR.13 engine earmarked for the CF-105 Mk 2 production aircraft. After evaluating the engineering mock-ups and the full-sized wooden mock-up in February 1956, the RCAF demanded changes including the RCA-Victor Astra fire-control system firing the equally advanced Sparrow II in place of the MX-1179/Falcon combination. The Astra proved to be problematic, resulting in major delays, and when the US Navy cancelled the Sparrow II in 1956, Canadair was quickly brought in to continue the Sparrow programme in Canada. Approval for production was given in 1955, and the first CF-105 Mk 1 (RL-201) was rolled out on 4 October 1957. The J75 engine was slightly heavier than its predecessor, had thus had to be balanced by the addition of ballast in the nose to keep the centre of gravity in the right position, and the delayed Astra fire-control system was also replaced by ballast. The weapons bay was used for the carriage of test equipment. In August 1957, the Canadian government signed the NORAD (North American Air Defense) agreement with the USA, making Canada a partner with the US command and control system. The USAF was then in the process of completely automating its air-defence system with the SAGE (Semi-Automatic Ground Environment) project, and offered Canada the opportunity to share this sensitive information for the air defence of the North America continent. One component of the SAGE system was the Boeing Bomarc nuclear-tipped anti-aircraft missile. This led to studies on basing Bomarc missiles in Canada and so pushed the North American continent’s outer defence line farther to the north. The need to defend against ballistic missiles was also becoming a priority, and elements of the Canadian government led by George Pearkes, the Minister of National Defence, started to call for the replacement of the CF-105 by the Bomarc. Canada was meanwhile attempting to sell the CF-105 to the USA and UK, but found no interest. Another milestone was placed round the neck of the CF-105 programme when France, spurred by media speculation that the Iroquois engine programme might also be cancelled, decided not to order 300 Iroquois engines for the Dassault Mirage IV bomber. The cancellation of the CF-105 programme was announced on 20 February 1959, and though efforts were made to keep the early aircraft in use as test aircraft, possible operators declined the offers. Within two months of the programme’s cancellation, the scrapping of all aircraft, engines, production tooling and technical data was ordered, supposedly to ensure the destruction of all classified and secret materials used in the CF-105 and Iroquois programmes.